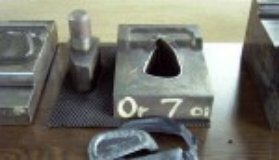 The cast irons in your bag are the most common make of irons. 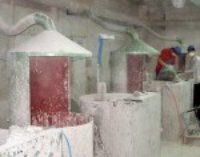 The casting process involves pouring molten metal into preformed cast or molds. All cast iron clubs are made from stainless steel. Stainless steel combines iron with nickel and chromium and other trace materials. Most good quality irons are made from either 17-4 or 431 grade stainless steel. Cast clubheads made from 17-4 steel are a little harder than clubs made from 431. If you want to have the lie and lofts adjusted it will be a little more difficult with 17-4 steel. However, a good clubmaker with the right tools should be able to handle the job. 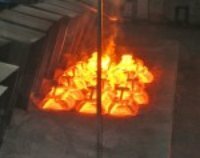 The investment casting process produces cast irons that can be formed into very intricate shapes which allows for variations in weight distribution in the head, also known as perimeter weighting. By the way, if you find irons made fron Zinc, they cannot be altered at all. Zinc ironheads are the cheapet ironheads and are typicallly offered by mass merchandizers. You can identify them by their large heads and their softness, which means they will ding and get marked up easily. Before an iron head is put into production, it is designed on a computer using sophisticated CAD software. The computer design is used as the basis for the development of a mold. 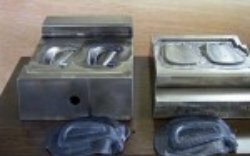 Once a mold has been produced it is used in the production of each and every club head. As you can see in this fiqure, the mold is a mirror image of the club head, and has two parts to it and has a small opening on the side. The mold is inserted into a wax injection molding machine and boiling hot wax is squirted into the mold. The outcome is an iron head that is made of wax. 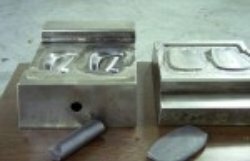 A wax mold is made for every piece that is manufactured. 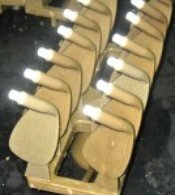 For example a set of 9 cast irons will require 9 wax molds, each representing a different loft. 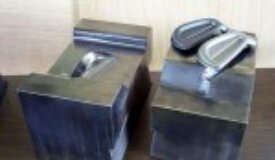 The wax molds are then checked individually for minor blemishes and a fine nail file is used to remove excess wax particles that might be present on the mold, as this is important as any imperfections on the wax mold will be present in the cast iron production club head. This takes place manually, and each club head piece is subject to this process. The wax club heads are then melted onto a wax tree in groups of 14 and dipped into quicksand. The quicksand adheres to the wax and forms a shell around the outskirts of the mold. 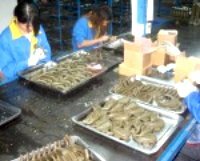 The tree is left to dry in a refrigerated room and this process is repeated five times. Quicksand is used because it can withstand the extreme temperatures required when pouring the molten iron and also because of its ability to form a perfectly smooth shell around the intricate details of the wax club head. A stainless steel alloy is heated up to 1500° celsius at which point it becomes molten liquid and glows red hot. 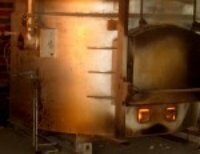 Once the metal is molten and the quick sand is the same temperature, the quicksand molds are removed from the furnace and walked across to the pouring station where the molten steel is poured into the quicksand mold. The red hot quicksand molds containing the molten metal are placed on a shelf of sand and left to harden. 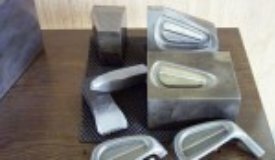 Once the steel has hardened, the quicksand outer shell is cracked off the cast iron clubs molds and the unpolished golf heads are exposed. At this stage the club heads are still connected to the tree. The club heads are individually cut off of the tree by a metal cutter and the finishing process begins. The finishing process is a long process. It begins by polishing the cast iron club head and sandblasting the face. Once the club has been polished and sand blasted, it goes through a quality assurance process where the loft, lie, weight, hozel diameter and variance measurements are tested to ensure they fall within the strict tolerances set by the manufacturer of the clubs and by the R&A. The cast iron club heads are then trucked to a different location where skilled workers paint the logos and score lines onto the club head. The logo’s are a part of the original mold however they must be colored in before they are ready to be sold and used. The steel used for forged irons is carbon steel. This is the material that has been used for quality clubs since the 1800’s. Carbon steel is made from good old fashioned iron combined with carbon. Carbon steel has a tendency to rust so it is usually electroplated (coated) with chromium and nickel. The advantage of carbon steel irons over cast irons is that it is very malleable (soft) and so lends itself to the forging process. Some say hitting a ball with forged clubs has a softer feel. This softness does make it easier to adjust for lie and loft but it also may lead to the lie and loft changing over time due to use. This is why most pros have their lofts and lies checked pretty well every day. Forging uses massive machines that hammer the raw metal into the desired shape. Its more expensive and more limited in terms of variations in club design.It does create a club with a very soft feel and better players believe they can control and “work” the ball better with forged irons. The head starts life as cylindrical stick of mild iron, which is then heated to 1200 degrees Celsius, so that the iron maintains its chemical integrity. Note that this is the structure for the head and not the hosel, which is added later. The heated cylinder is then struck with a massive forging hammer, which creates the initial rough shape of the head. The edges are now trimmed and the rough head is now pounded again with the forging hammer. The force used is very precise, and along with the head of the rough head this creates the molecular structure of the head. The head is hit a third and fourth time, by which the head is now well defined and is in a smooth and unblemished state. Once in this state, the score lines and any artwork and iron numbers can be stamped into the head. The hosel now comes into the picture. The hosel cylinder is now spin welded onto the head in a very precise manner to make sure lofts and lies are of an exact nature. At this point we have a raw but technically advanced head, ready to be finished off. Grinding and polishing now takes place to make sure each head is taken to its specified weight. Each iron has its own designated weight which will generally see a 4 gram increment between irons, which allows for very tight swing weight matching. A final polishing is done in a purposely-built polishing barrel, which is capable of producing any sort of finish required via a variety of techniques. Now plating is applied, using either Nickel Chrome or W Nickel for a Satin Finish to the face with a touch of copper to the chrome for the rest of the club head and hosel. The face now requires a light sandblasting to give it a bit of grip for the ball to munch on. The chrome is taped over here, allowing only the face to be blasted.